The Skinny Bundle: Cord Cutting or Just Cable TV Over the Internet? 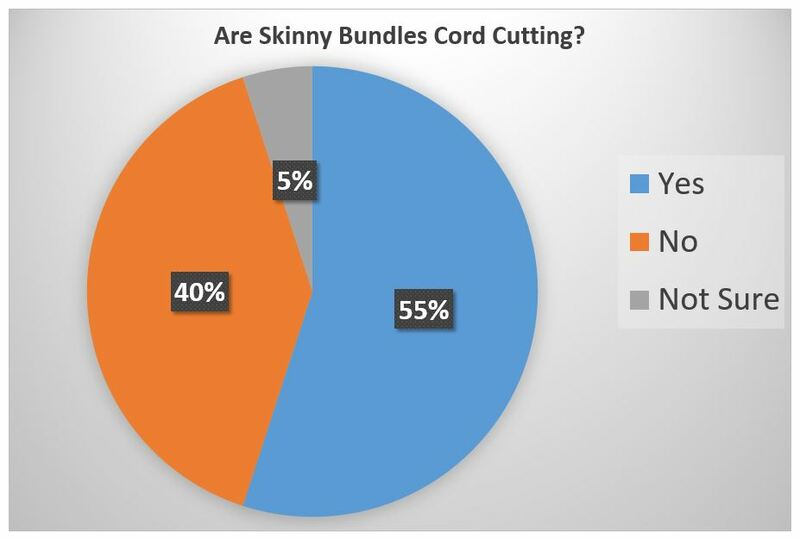 The Skinny Bundle: Is it Cord Cutting, or Just Cable TV Over the Internet? The TV industry, journalists and Wall Street consider live multi-channel streaming services (also known as Skinny Bundles) like Sling TV, DirecTV Now and Sony’s PlayStation Vue to be part and parcel of cord cutting. But are these services really cord cutting, and should they be categorized as such? Regardless of what we think the answer should be, the only one that really matters is the opinion of consumers. Channel Master recently undertook a large study of the cord cutting processes and tools of antenna users. We had barely begun when we realized that we needed to clarify some items immediately. It became obvious that not all consumers consider live multi-channel streaming services to be cord cutting. In fact, opinions were nearly split down the middle. 55% of respondents using one of these services self-identified as cord cutters, 40% specifically said that they were not cord cutters, and 5% were unsure. For the most part, we are believers of the general rule that: if it looks like a duck, swims like a duck and quacks like a duck, then it probably is a duck. However, the Cord Cutting duck can look and sound different depending on how you’re viewing it. People who consider these services to be cord cutting do so mostly because of the business model - they can subscribe month-to-month with no contract. People who do not consider these services to be cord cutting do so mostly because the content still works like a standard pay-TV service. However, all subscribers agreed on one particular item: Any live TV streaming service would be considered cord cutting if it were truly an a la carte offering with the ability to choose only the channels that they want. Why is this information important to us? Well, if consumers don't know whether or not they are cord cutters, that presents a pretty obvious hurdle for researchers. First and foremost, it's obvious that researchers need to be very clear to define labels for services when designing and implementing surveys. It is also very important that the researcher have a thorough understanding of the TV industry and how it works. If these two criteria are not met, the resulting survey data will be misleading at best and may even be completely useless. We see a lot of industry research reports and it's not uncommon that we spot major flaws in the data simply due to the way a question is being asked, or the absence of a clarifying label. Yet somehow these research reports still make headlines across industry publications and even cross over into major consumer publications. One very interesting fact resulting from this little side-survey was the realization that consumers do not seem to relate cord cutting to any specific brand. Consumers seem to be more than willing to accept a cord cutting solution under the Comcast brand, for example, as long as it meets the criteria. It's quite possible that Sling TV could have launched as DISH Lite or DISH Stream and done just as well, maybe even avoided some brand confusion. DirecTV had no qualms about launching as DirecTV Now and the inclusion of the pay-TV brand in the service name does not seem to have had any negative effect.